Published to mark the four hundredth anniversary of Belfast's charter, Belfast 400 presents a new history of one of the world’s most fascinating and most misunderstood cities. The misunderstanding, and the fascination, arise from the same contradictions. Belfast was a significant part of the story of Great Britain’s rise to industrial greatness. But it was a city located, not in Great Britain, but in Ireland. It was one of the main theatres in which the conflicts of identity that have created modern Ireland were fought out. Yet both its politics and its industrial character set it wholly apart from other Irish towns. A central part of the history of both societies, it has never fitted neatly into the accepted narrative of either. Against this background Belfast 400 seeks to recapture the true history of Ireland’s second city in all its complexity. In doing so it asks many questions. Why did such an apparently unfavourable spot, a waterlogged river mouth, persist for centuries – long before the appearance of the first town – as a site of human settlement. Why did what was intended to be a minor outpost of British settlement in the province of Ulster become its most important urban centre? How did the medium-sized commercial centre that thus emerged expand to become, by the beginning of the twentieth century, one of the world’s great centres of shipbuilding and linen manufacture? Finally, and most of all, what did the development of this great industrial centre mean for those who lived there? How did its inhabitants experience the birth pangs of an industrial society, the late nineteenth and early twentieth-century heyday of manufacturing, and the long decline that followed? How far, equally, can the city of Belfast now redefine its identity, and the still often fraught relationships that exist between different sections of its population, to face the challenges of the twenty-first century? Published to mark the four hundredth anniversary of Belfast's charter. Presents a new history of one of the world’s most fascinating and most misunderstood cities. Supported by Belfast City Council and Queens University Belfast Lavishly illustrated, beautifuly design, fantastic reading for all - a must-have publication. Contributors Dominic Bryan is Director of the Insitute of Irish Studies at Queen’s University, Belfast. Sean Connolly is Professor of Irish History at Queen’s University, Belfast. Raymond Gillespie teaches history in National University of Ireland, Maynooth. Philip Macdonald is an archaeologist employed in the Centre for Archaeological Fieldwork at Queen’s University, Belfast. Gillian McIntosh is a social and cultural historian, who has worked as a research fellow at Queen’s University since 1997. Ruairí Ó Baoill works in the Centre for Archaeological Fieldwork, School of Geography, Archaeology and Palaeoecology, Queen’s University, Belfast. Sean O’Connell is a Senior Lecturer in Modern History at Queen’s University, Belfast. Stephen Royle is Professor of Island Geography at Queen’s University, Belfast. 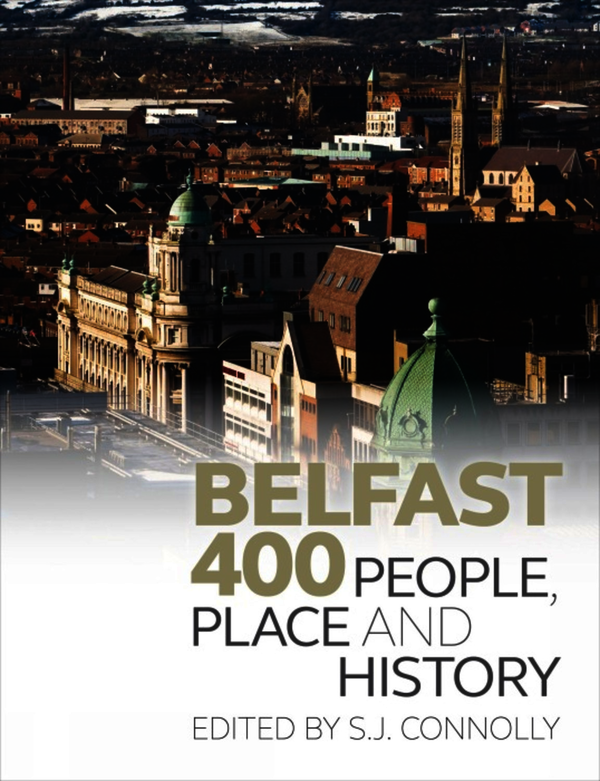 Published to mark the four hundredth anniversary of the town’s foundation, Belfast 400 draws on a wide range of recent research to present a new history of one of the world’s most fascinating and most misunderstood cities. The misunderstanding, and the fascination, arise from the same contradictions. Belfast was a significant part of the story of Great Britain’s rise to industrial greatness. But it was a city located, not in Great Britain, but in Ireland. It was one of the main theatres in which the conflicts of identity that have created modern Ireland were fought out. Yet both its politics and its industrial character set it wholly apart from other Irish towns. A central part of the history of both societies, it has never fitted neatly into the accepted narrative of either. Against this background Belfast 400 seeks to recapture the true history of Ireland’s second city in all its complexity. In doing so it asks many questions. Why did such an apparently unfavourable spot, a waterlogged river mouth, persist for centuries – long before the appearance of the first town – as a site of human settlement. Why did what was intended to be a minor outpost of British settlement in the province of Ulster become its most important urban centre? How did the medium-sized commercial centre that thus emerged expand to become, by the beginning of the twentieth century, one of the world’s great centres of shipbuilding and linen manufacture? Finally, and most of all, what did the development of this great industrial centre mean for those who lived there? How did its inhabitants experience the birth pangs of an industrial society, the late nineteenth and early twentieth-century heyday of manufacturing, and the long decline that followed? How far, equally, can the city of Belfast now redefine its identity, and the still often fraught relationships that exist between different sections of its population, to face the challenges of the twenty-first century? Published to mark the four hundredth anniversary of the town’s foundation, Belfast 400. Presents a new history of one of the world’s most fascinating and most misunderstood cities. Suported by Belfast City Council and Queens University Belfast Lavishly illustrated, beautifully designed, fantastic reading for all - a must-have publication. For my money it would make a perfect Christmas present for the history buff in your life. ... this book is designed to mark this year’s 400th anniversary of Belfast’s charter. In format and content it is high-brow-meets-coffee-table and the illustrations and maps are quite stunning. The book will make good a good present for anyone interested in the socio-politico-economic history of Belfast and wanting to get ahead of next year’s commemorations. There have been many books written about our city’s rich history, but this is undoubtedly the most ambitious, and also the most timely, coinciding as it does with the 400th anniversary of the granting of the original charter. It will be a worthy addition to the canon of literature on our city, and no doubt will be essential reading for everyone with an interest in the story of what has made the Belfast we know today. … this is an excellent, readable and informative work of sustained scholarship. With lavish illustrations, carefully written prose, and with the depth of research worn lightly in each chapter, Belfast 400 is a fitting marker of the city’s anniversary, as well as a clear reminder that humanity lived there before the plantation. It is, moreover, a wholly suitable product, rendered at a very reasonable price, for both public and academic consumption. This editor and his contributors, as well as those who subsidised it, deserve our appreciation. In a book celebrating both the anniversary of Belfast’s first charter in 1613 and the end of its more recent Troubles, a chequered history emerges: a small, inauspiciously located private town becomes one of the great boom cities of the British Empire. Buildings including the magnificent City Hall of 1906 and the Titanic museum of 2012 flag high points in an epic story. S. J. Connolly is Professor of Irish History and Director of Research, Queens University Belfast.